The Market is accessed from the menu on the right hand side of the screen. 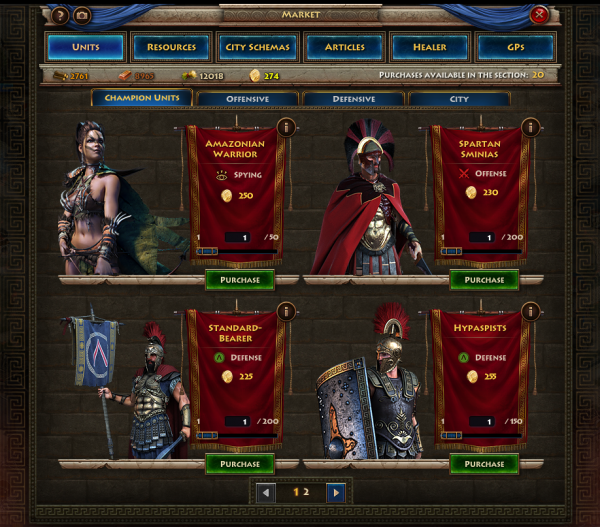 Unlike other Plarium games, Sparta does not have a designated "Premium Content" building and you must use the menu to access this content. Not all premium features are accessed via the market but a large portion are as detailed below. In this section you can purchase Champion, Offense and Defense Units. There is also a tab that provides an alternative means of purchasing City Fortifications instead of using the Building Construction Menu. There is a limit to the number of purchases you can make each day in this section and each purchase can be used to buy a limited number of troops. However, the limit is quite generous and most individuals should not find this to be an issue. This is the primary means of acquiring Champion units though some might be gained via occasional quests. Normal units can also be purchased via the Market in a pinch even above your current Article Agreement level. Do note however that this is the least efficient means of gaining normal units so tread cautiously as there are many other places to invest your precious Drachmas. This tab provides you two different means of improving your resource production. You can purchase resources outright in amounts of 5 or 10 thousand or you can purchase a temporary 25% boost to your production of a particular resource over 3 days. Boosts are relatively inexpensive but of course they take time to return their value. Generally you would want to take advantage of this tab when you are short on resources for a particular purchase like a Coalition Upgrade or if you find you need additional resource productivity to meet shortfalls such as if you were to gain extra troops that your current production can not feed. You can buy Sketches which you will need to use if you want to upgrade your buildings or your warriors in Agreements. You need to buy relics if you don't have enough of them to rank up your army orders. This tab serves two purposes. First it allows you to buy schemas for your city. These schemas provide massive defense bonuses to your city and are by far the most efficient Drachma to defense point purchase you can make if you intend to buy defense for your city. The second purpose of the tab is to switch schemas on or off. You may purchase multiple schemas and switch between them if you wish and you may also chose to switch your city back to the normal look. However, please note that your city only benefits from the active schema (if any) and that you may only activate one at a time. This tab provides you a means of accelerating your access to articles and thus to advance your agreements tree. You may only purchase non-GP articles on this tab and once all of your non-GP agreements have been signed you will see no more articles on this tab. Since Sparta cuts off non-GP articles at the Heavy Infantry (Tier 2) level, you will find that you rapidly outgrow this tab and must instead rely on the GP tab for further development. This tab provides one of the best options for spending your Drachmas and many power players make heavy use of it. Whenever you take casualties in ANY battle a portion of your lost troops will make their way to this tab for a period of 10 days. You have 10 days to revive them for 50% of their normal Drachma cost making the troops purchased from this tab an excellent deal. As discussed above though, the clock is ticking. One of the common means for attaining level 125 in Persian Positions is to simple use this tab to revive any troops that die in battle as you progress from one Persian Position Quest to another as fast as the game provides them to you. This tab is technically not premium content since nothing here is purchased with Drachmas (i.e. bought directly with real world currency). Instead this tab is the sole location you were you spend the rare GP currency you gain through Global Quests and Storyline Missions (Chosen By the Fates). In Sparta this tab is especially important because your daily articles stop at Heavy Infantry and the only way to progress to Tier III and IV units (Phalanx and Cavalry) is to purchase the required articles via this tab. Currently Purchasable Articles include: Argos (4), Dion (8), Troy (8), Olympia (8), Corinth (8), Pella (8), and Sparta (8). Individuals require 25 GPs each. Thus Argos requires 100 GPs and the rest require 200 GPs to research. It will likely take you some time to acquire all necessary GPs for these agreements. However, the game distinguishes between GP and non-GP agreements and you will thus gain your 7% bonus to Timber and Bronze after completing the non-GP (Heavy Infantry) agreements. Three other options for your GP use are to purchase single scrolls of wisdom (used in the Academy) for 100 GPs, Purchase extra contact slots at 50 GPs for 10 extra slots (Use via the War Council) or purchase Galley Boosts increasing their carry capacity by 10% for 50G GPs. This page was last modified on 24 February 2018, at 18:29. This page has been accessed 6,534 times.